Old World Daughter, New World Mother: An Education in Love and Freedom. By Maria Laurino. Norton, 224 pp., $23.95. Maria Laurino entered Georgetown University in the late 1970s, “a member of that privileged generation that reaped the benefits, without doing any of the grassroots work,” of the women’s movement that flowered decade earlier. She tries to repay the debt in a book that begins as a memoir of growing up Italian-American in Short Hills, New Jersey, and devolves into a brief for an updated feminist ethic that combines an Old World respect for families with a New World admiration for individualism. Old World Daughter, New World Mother resembles a dish of parmesan-cheese ice cream, that acquired taste found in some Italian restaurants. 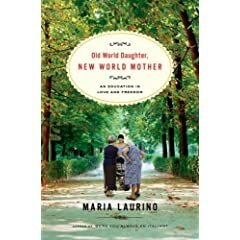 Laurino writes memorably about having a disabled brother and developing severe preeclampsia after becoming pregnant at the age of 37. But she links such experiences, not always plausibly, to a call for a “social revolution” that would require unprecedented female harmony and seemingly little work by men: “Once women agree on a vision for a national feminist movement that makes care its core principle, more creative solutions to help working parents will abound.” Given that both sexes — and their children — would benefit from those solutions, why should women alone have to agree on a vision for them? Shouldn’t men bear some of the responsibility for it? In making her case for revolution, Laurino draws on the views and jargon of literary and gender theorists and scholars such as the Marxist critic Terry Eagleton. Yet a curiously old-fashioned idea appears to underlie her book: that bringing about the revolution is, in effect, “women’s work.” The reality is often quite different. The reason many corporations now offer flexible schedules and refer to “maternity leave” as “parental leave” is in part that men are increasingly are seeking to spend more time with newborns and older children. Laurino admits that’s she nostalgic for the excitement of 60s feminists for new ideas – at times she sounds weirdly like the men who, before the war in Iraq, lamented that they were born too late for Vietnam – and her sentimentality may help to explain why this book has the air of a throwback. Her Were You Always an Italian? showed that she has a lively perspective on her ancestry. Old World Daughter, New World Mother yokes her background so aggressively to other topics that it leaves the impression that, wittingly or not, she is in danger of becoming a professional Italian-American. Best line: No. 1: “In her book The Equality Trap, Mary Ann Mason, now dean of the graduate school at Berkeley, told of how the National Organization for Women and the National Women’s Political Caucus filed a friend-of-the-court brief in the early eighties in favor of the California Federal Savings and Loan after the bank fired a receptionist for taking a four-month unpaid maternity leave.” If true, this startling tone-deafness to working women’s needs would help to explain why feminist groups have had trouble finding support from a new generation. No. 2: “When Mary Met Livia,” the title for a chapter about the collision between images of the liberated Mary Tyler Moore and the tradition-bound Livia Soprano in Laurino’s life. Caveat lector: This review was based on an advance reader’s edition. Some material in the finished book may differ. About the author: Laurino lives in New York City. She has worked for the Village Voice and as a speechwriter for former mayor David Dinkins. One-Minute Book Reviews is for people who like books but dislike hype and review inflation.